The Great Northern Paper mill in East Millinocket, Maine. At the FAME meeting in Augusta, executives with Cate Street Capital spoke of a recent technology partnership that will allow Thermogen to ramp up more quickly and produce more than 300,000 metric tons of black wood pellets a year. Then, board members had a chance to question company officials. "I think we seem to be avoiding the 800-pound gorilla," said FAME board member Larry Mitchell, who voted last October to approve the $25 million for Thermogen. 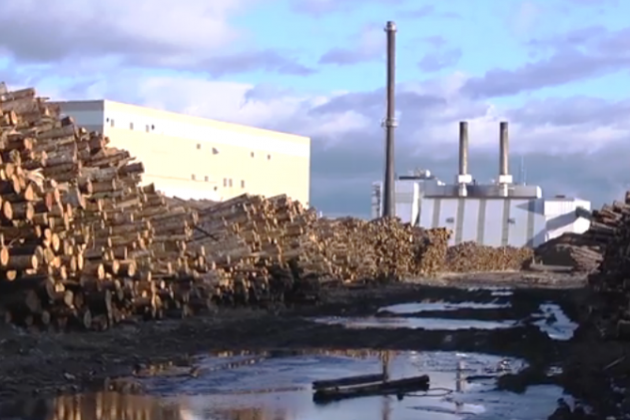 But the recent technologial boost to Thermogen's business plan wasn't enough to ease Mitchell's concerns about what the financial problems at Cate Street's Great Northern mill in East Millinocket might mean for the new pellet plant. "How can you assure me that going beyond the collateral that's measured is worthwhile?" Mitchell asked. This winter, Great Northern had to temporarily shut down, lay off nearly all of its 256 workers and restructure, due to a declining paper market and high energy prices. The mill hasn't turned a profit since Cate Street reopened it in the fall of 2011. Great Northern's vendors haven't been paid in months. And the company owes the towns of Millinocket and East Millinocket nearly $4 million in back property taxes. "Thermogen is a separate business plan," said Cate Street's Alexandra Ritchie. The bio-coal market, Ritchie told the FAME board, is an emerging market. "It's a next-generation forest products industry. And it has a business plan that is viable, and viable long term." And from day one, the company has tied the future of the old mill to this new emerging market. Christopher Howard, an attorney with the firm Pierce Atwood, is Cate Street's lawyer. "In October of 2011, when Cate Street Capital acquired the Great Northern Mill, one of the things we told the media, told the state, made everyone aware, that the long-term viability of that mill was tied to this project," Howard said. But Cate Street said it will be tough to make the project happen with $16 million from FAME instead of $25 million. Company officials had a hard time hiding their disappointment throughout the meeting after learning that FAME's staff was recommending the lower figure - though they did hold out hope that supporters on the board, like Gov. Paul LePage's forest products adviser Rosaire Pelletier, might convince others to reconsider. Pelletier made a plea for the higher figure before the vote. "Maybe we should put a gate after Bangor and put "Out of Business" for everybody else," Pelletier said. "There's not too many job opportunities up there and I feel for these people." But others on the board noted that bio-coal, and the market for black pellets, is still relatively new. Bruce Wagner is FAME's CEO. "If you take new product risk and new market risk and compound them, it's an elevated level of risk,' he said. "And I feel that this does not meet the level of strong likelihood at the $25 million level." The board approved the $16 million loan by an 8-to-5 vote. Cate Street has promised that Great Northern's property tax debts will be paid at closing. Cate Street's Alexandra Ritchie expressed disappointment at the vote. "This project has been out in the market as we continue to fund the equity, and as we continue to develop markets and end users," she said. "And it was represented that it had a $25 million state-backed guarantee. So this potentially reduces confidence in the overall picture, and that's something we need to consider." Ritchie said Cate Street needs time to regroup and take another look at its financials, before deciding, definitively, whether to move ahead with the Thermogen project.